You must plan how Oracle Inventory represents your company’s inventory sites and business units. This includes defining organizations, locations, subinventories, and locators depending on your company structure. You also must plan how to implement certain parameters and what level of the structure controls them. Multi-org often refers to an Oracle Applications setup used to enable multiple business units in a single install. With multi-org, a business enterprise may set up multiple business units with differing sets of books, operating units, and legal entities all within a single instance. With multi-org, goods may be sold out of one operating unit or legal entity and shipped to another, and the system will process an intercompany sale to properly account for it. Multi-org, however, should not be mistaken for installs with multiple inventory organizations. 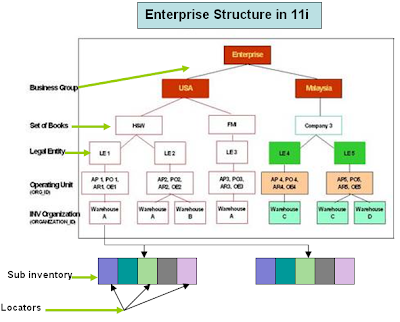 You do not have to use Oracle Applications multi-org to support multiple inventory organizations if all the inventory organizations share the same set of books, operating unit, and legal entity. Location: A location is simply a name and address, and is assigned to an organization or used to indicate delivery information on a purchase order. You may define as many locations as you like, but only one location may be assigned to an inventory organization. Business group is a group of companies that does business in different markets under common administrative or financial control whose members are linked by relations of interpersonal trust on the bases of similar personal ethnic or commercial background a business group. Set of Books (SOB): The financial entity that represents the chart of accounts, fiscal calendar, and base currency. The SOB is set up in the General Ledger. Legal Entity Organization: An entity used to represent a legal company. Fiscal and tax reporting are done at the Legal Entity level. A legal employer is a legal entity that is responsible for employing people in a particular country. Therefore, if you employ people in a country, then you must have at least one organization classified as a legal entity and a legal employer. The Configuration Workbench classifies an organization as a GRE/Legal Entity where your enterprise operates in a country, and classifies it as an Employer if you employ people in that country also. For example, you can have a legal entity in a country where you do business, but do not employ people in that country. Operating Unit Organization: A business unit that shares a common Purchasing, Accounts Payable, Order Entry and Accounts Receivable setup. An operating unit may consist of multiple inventory organizations, with multiple manufacturing sites, distribution centers, and sales offices, but they share a common sales order and purchase order system. For example, a sales order may have lines shipping from different inventory organizations or a purchase order may have lines destined for different inventory organizations. Inventory Organization: An entity used to represent a manufacturing or distribution site. Inventory organizations are where a user tracks on-hand balances, manufactures goods, and transacts the daily ins and outs of material movement. An inventory organization is the lowest level entity for costing goods, planning material requirements, and securing system access. Only a single address may be assigned to an Inventory Organization. An inventory organization is assigned a Set of Books which determines the chart of accounts, fiscal calendar, and base currency for all financial and value added activities that occur within the organization. Inventory Organizations are also assigned to a Legal Entity Organization and an Operating Unit Organization. A variation on the inventory organization is the master item organization. Generally, with Oracle Applications a single inventory organization is created and designated at the master organization. Items are defined first in the master organization, and then enabled in other inventory organizations as necessary. Some of the item attributes are set as controlled at the master organization and therefore the attribute values cannot be updated within individual inventory organizations. Category sets may also be designated as master organization level. Cross-references are also master level only or master level optional as well. Subinventory: Physical or logical locations for storing inventory. Subinventories are generally defined to represent the main stores area as well as stocking points on the production floor. Additional subinventories may be used to specify supply closets or cabinets and the cage area for discrepant material. Subinventories are flagged as to availability for planning (nettable), reservations, and available to promise checks, thereby determining the availability of the material stored in the subinventory. Subinventories are assigned material asset account numbers. As goods move in and out of a subinventory a transaction posts to the asset account. Stock Locator: A physical area within a stockroom. The stock locator is a key flexfield that is often defined as a multiple segment flexfield with the segments representing the physical layout of a stockroom. For example, a stockroom may be laid out in rows of shelves with bins on the shelves, each numbered so that a row/shelf/bin combination would direct someone to a particular material storage compartment. Such an implementation would define a locator flexfield as a 3 segment flexfield with segments for row, shelf, and bin. We never attach any LE/OU/INV with BG in front end...but its available in HR_ALL_ORGANIZATION_UNITS in column Business_Group_ID. So the question is from where it comes? First we create a Business Group. Whenever we create a business group the system creates an organization with type businessgroup and attaches a business group ID 'N' which is same as the organization ID for that Business group. After that we attach the business group to a responsibility through the profile option HR: Business Group. Next we create whenever we create a new LE/OU/Inv with one responsibility the system will attach the Business Group which is attached with the HR: Business group for that particular responsibility.